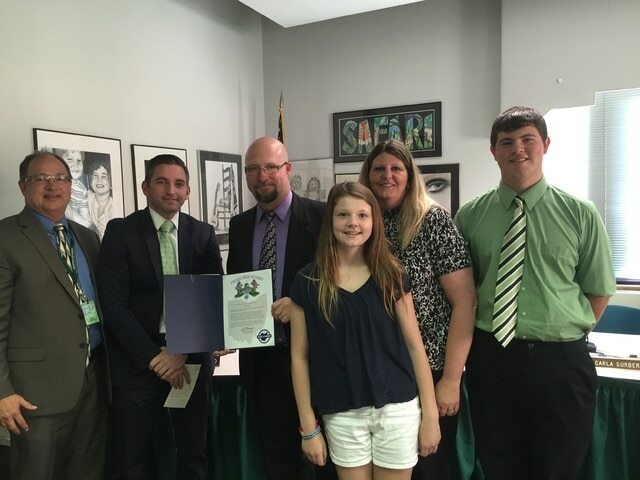 GREENVILLE – Ohio Treasurer Josh Mandel’s office recently visited Greenville City Schools Career Tech Center in Greenville to present an ‘Ohio Strong’ Award. Ohio Strong is an effort started by Mandel to help recognize local workers in manufacturing and the skilled trades, and raise public awareness to encourage more people to pursue careers in these fields. As part of this initiative, a regional representative from the Ohio Treasurer’s office presented an Ohio Strong Award to Chris Sykes, engineering instructor at the Greenville Career Tech Center, after Sykes was nominated as an example of an employee who deserved recognition for dedication to his trade. A recent Bureau of Labor Statistics study showed that 48 percent of college graduates are working in jobs that don’t require a four-year degree. At the same time, according to a recent Skills Gap Survey by the Manufacturing Institute, approximately 600,000 manufacturing jobs are unfilled nationally because employers can’t find qualified workers. The Ohio Strong Award is intended help highlight examples of Ohioans working in manufacturing and the skilled trades in order to raise public awareness of Ohio’s need for more people to join these fields. Treasurer Mandel is looking for workers within Ohio organizations who have gone above and beyond the call of duty in their jobs, or to help train the next generation of workers. Anyone who would like to nominate an employee or co-worker for recognition should visit OhioTreasurer.gov/OhioStrong. There you will find a form that asks for a short statement describing why someone you know is deserving of consideration. Ohio Strong Award recipients receive a resolution from Mandel and will be featured on OhioTreasurer.gov.